It's been two years since President Bush admitted we are "addicted to oil." This expensive addiction has taken a toll on our economy while funding major sponsors of the jihadis and other terrorists that seek to harm us. We have been told the only way to break this addiction is to reduce consumption, as in the recently passed mandate to increase fuel efficiency. I am all for conservation and improving fuel economy, as with hybrid cars, but even if everyone drove a hybrid it would just slow the rate of growth in our consumption of oil. Those savings will be more than offset by our reduction in national oil production because we are unwilling to drill in Alaska and offshore. In other words, the Middle East, Russia and Venezuela have us over a barrel. I suggest that in the short term, we dig our way out of this problem. The United States is the "Saudi Arabia of coal," and Pennsylvania is sitting on hundreds of years of this affordable and accessible resource, which, with innovative technologies - spearheaded by Pennsylvanians - we can use cleanly and right away. Pennsylvania coal already generates most of the electricity in this state. The industry is in the process of doing it more cleanly through clean-coal technologies, such as gasification of coal into methanol, a form of alcohol that can be burned in internal combustion engines directly or used to manufacture synthetic gasoline and chemicals. These technologies can lead to a whole host of new clean uses that can help us reduce oil imports. Just two hours up the road from Philadelphia, the nation's first coal-to-gas-to-diesel facility may soon be developed in Schuylkill County; word was expected today on a U.S. Department of Energy loan of $100 million to help enable construction. This fuel, which is currently being used in another coal-rich country, South Africa, can be used to power jets, heat your home, and run diesel engines. Across Pennsylvania, farmers are also digging and planting corn and other crops that will be turned into ethanol that can replace gasoline in our cars. Most cars in America can't run on ethanol, however, so who is going to install ethanol pumps at the gas station without the cars to run on it? At this point I would say to all of my hard-core conservative friends: Hold on to your hats. What we need is a government mandate! We need to mandate that all cars sold in the United States, starting with the 2010 model year, be "flex-fuel vehicles" - that is, they should be able to run on a blend that is 85 percent ethanol and 15 percent gasoline (the so-called E85 blend), or even a coal-derived methanol/gas mixture. This mandate would cost a fraction of the new fuel economy standard with the added benefit of saving barrels more oil. What would ChÃ¡vez and company do in response? Jack up production to kill this industry off before it gets off the ground. So - hold on again, conservatives - let's put a temporary tax trigger on imported oil if the price hits $50 per barrel. Anyone think it will go that low without this idea? Finally, Congress should immediately repeal the protectionist $26 per barrel tax on imported ethanol. So while we may have a tax increase if oil prices drop, we offset that with an immediate tax cut on ethanol. That's a net win for taxpayers and our energy security. Ethanol will begin to flow into this country from poor third-world countries that don't have oil or much in the way of terrorists. U.S. popularity would soar in the third world and help the poor of those countries as well as ours. It's become a ritual: The economy grows sluggish and politicians rush to "do something" about it. What they do almost never has a beneficial economic impact, as any reputable economist will tell you. But what if lawmakers could guarantee that the price you pay to fill the tank of your car will go down, not up, in the years ahead? What if they could launch a new industry that creates more jobs for more Americans? What if this would produce environmental benefits, too? Would that not send a message to the markets? And would that not represent the kind of change so many politicians have been promising? Here's the deal:Â Everyone who is not an economic illiterate knows that competition leads to lower prices. 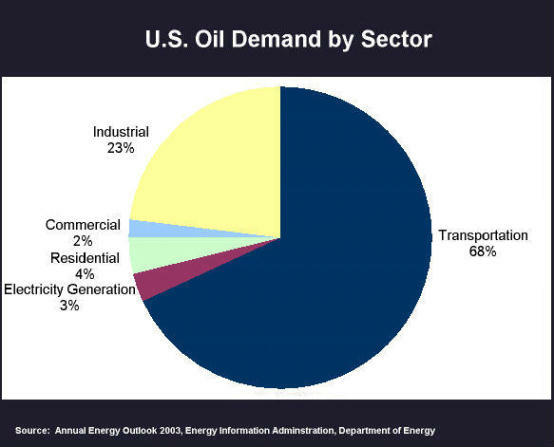 But there is no competitive market in transportation fuels. In most parts of the country, you can buy gasoline or you can buy gasoline. And most cars can run on gasoline or gasoline.It doesn't have to be that way. There are alternative fuels. And there are automobiles built to burn them. But there is a chicken-and-egg dilemma: Why buy a car that can use alternative fuels if those fuels are not readily available at a local service station? Why devote a pump at a local service station to alternative fuels if there are few customers asking for them? Elected officials could solve this problem with the stroke of a pen. An "open standards" fuel law would require that all new cars sold in the United States be flexible-fuel vehicles -- able to run not just on gasoline, but also on a variety of alcohol-based fuels. A car that is flexible-fuel capable costs only about $100 more. But if you want to make this transition cost-neutral for the automobile companies, consider a tax break to reward them for making the transition as quickly as possible. Robert Zubrin's opedÂ in the Rocky Mountains news is an excellent explanation of how opening up the transportation fuel market to competition would result in a reallocation of resources on a global scale, from petrotyranies to third world farmers. Through fuel competition and Congressional flex fuel mandate we can stop the bleeding of our economy and the enrichment of our enemies while helping the economies of the developing world -- "We could effectively take more than a trillion dollars a year that is now going to the oil cartel, and direct it toward the world agricultural sector instead. This would not only be of great benefit to farmers here, but an enormous boon to the Third World, which otherwise faces brutal looting through continued unconstrained OPEC price hikes." One of the Administration's key goals has been democratization.Â Since most ofÂ the world's oil is controlled by dictatorships, that goal stands in stark conflict with high oil prices. Listen to this NPR segment from 2005 (when oil price was about half what it is today)Â titled Analysts See U.S. Goals and Global Oil Needs in Conflict (if you've been keeping track of the Set America Free Coalition's work you will have heard this already, but it's brief and worth another listen.) Thomas Friedman's Discovery Channel documentary "Addicted to Oil" (featuringÂ the Coalition) elaborated on the conflict between democratization and expensive oil, calling itÂ The First Law of Petropolitics: "The price of oil and the pace of freedom always move in opposite directions in oil-rich petrolist states. According to the First Law of Petropolitics, the higher the average global crude oil price rises, the more free speech, free press, free and fair elections, an independent judiciary, the rule of law, and independent political parties are eroded. And these negative trends are reinforced by the fact that the higher the price goes, the less petrolist leaders are sensitive to what the world thinks or says about them. Conversely, according to the First Law of Petropolitics, the lower the price of oil, the more petrolist countries are forced to move toward a political system and a society that is more transparent, more sensitive to opposition voices, and more focused on building the legal and educational structures that will maximize their peopleâ€™s ability, both menâ€™s and womenâ€™s, to compete, start new companies, and attract investments from abroad. The lower the price of crude oil falls, the more petrolist leaders are sensitive to what outside forces think of them." Reviewing Freedom House's 2008 edition of its annual Freedom in the World report, the Wall Street Journal agrees: "Whereas once the economic inadequacy of communism spelled the eventual doom for Eastern Europe's totalitarians, today oil wealth could perpetuate authoritarians indefinitely if free nations let it. " We are addicted to oil; authoritarian suppliers are addicted to petrodollars. It's well past time to change the equation. If you would like to support this brave man's fight for our inalienable right to free speech, you can do so at his website EzraLevant.com. (Crossposted at Middle East Strategy at Harvard (MESH)) President Bushâ€™s appeal to the Saudis to increase oil production is more pitiful than understandable. At $100 a barrel, the United States bleeds over a billion dollars per day in order to finance its petroleum import needs. The result: ballooning trade deficits, growing unemployment, a weakened dollar and crumbling financial institutions like Citigroup and Merrill Lynch now forced to beg Persian Gulf monarchies for cash infusions. At current oil prices, the U.S. economy is melting faster than the ice caps. But despite the presidentâ€™s sweet-talk, his ridiculous appearance in a traditional Arab robe, his hand-holding with the Saudi monarchs, and even his gift of 900 precision-guided bombs, the Saudis were quick to respond with a slap in the face. Within one hour, the kingdomâ€™s oil minister announced that oil prices would remain tied to market forces and the Saudis would not open the spigot. This is hardly a surprise to me. The Saudisâ€”despite their claims that oil high prices are the doing of Wall Street speculators and American SUV-driving soccer momsâ€”are the first to blame for the current oil crisis. Their reluctance to invest in new production, their lack of transparency on reserve data and their anti-market practices, which prevent international oil companies from operating in their midst in any meaningful way, are the real reason for the quadrupling of prices in the past six years. The Saudis are also the prime reason for the failure of the Iraqi oil industry to take off. Exactly four years ago I warned that the United States was turning a blind eye to the Saudi failure to seal its border with Iraq. This led to a migration of thousands of Saudi jihadists into Iraq, a fact that contributed to the terror campaign against Iraqâ€™s oil industry. If not for the attacks, Iraq today could have been producing at least five million barrels per day. Instead it does less than three. Of course no one has ever held the Saudis accountable for the loss of two million barrels per dayâ€”an amount of oil that, were it in the market today, would have dropped prices by at least $30 a barrel. Weâ€™d rather beg than blame. The truth is that the Saudis feel quite cozy at $100 oil. The world economy hasnâ€™t come down (yet), the American public is docile, and oil-exporting countriesâ€”the recipients of a transfer on a scale the world has never knownâ€”are having a jolly time. Furthermore, the Saudis feel they have already met their obligation to the American economy by standing steadfast against other OPEC members like Iran and Venezuela, which are pushing for an OPEC decision to dump the dollar as the currency used for oil trades. Such a step could send the dollar down like a rocket. So much of this is our own doing. Two years ago President Bush committed a major blunder, allowing Saudi Arabiaâ€™s admission to the World Trade Organization. By dint of its leadership of the OPEC cartel, no other country is more responsible for violating free trade than Saudi Arabia. Yet, its admission was not contingent on any behavioral change. Thus the Saudis enjoy the benefits of free trade while continuing to manipulate the price of the worldâ€™s most important traded commodity. Furthermore, the United States has its own mechanisms to bring down oil prices. It owns 770 million barrels in strategic reserves. OECD countries have between them 4 billion barrels in stock. Yet, not a drop of oil has been released. Now that the Iowa caucuses are over, the United States could remove the 54-cent tariff on imported ethanol and bring billions of gallons of alternative fuel into the country almost overnight. This alone could drive down gasoline prices by at least 50 cents per gallon. And there are more strategic solutions which could remove the yoke of our oil dependence, like providing fuel choice and electrifying our transportation system. (We no longer produce electricity from oil.) The spectacle of American presidents kowtowing to the Saudis is as old as U.S. involvement in the Middle East. Six decades ago FDR had to steal a cigarette in a stairwell of the USS Quincy in order not to smoke in King Abdulazizâ€™s presence. (Winston Churchill, on the other hand, had a smoke and a drink!) With growing dependence on the Saudis, our sovereignty and freedom of action have been steadily eroded. Barring some serious action, no matter who the next president is, he or she will have to ride a lot of camels and wear a lot of robes to keep the oil barrels rolling. Walid Phares explains what $1 billion dollars in Iranian oil money means in terms of reach and power for the terrorist organization Hizballah. You are currently browsing the Set America Free Notes&Comments blog archives for January, 2008.